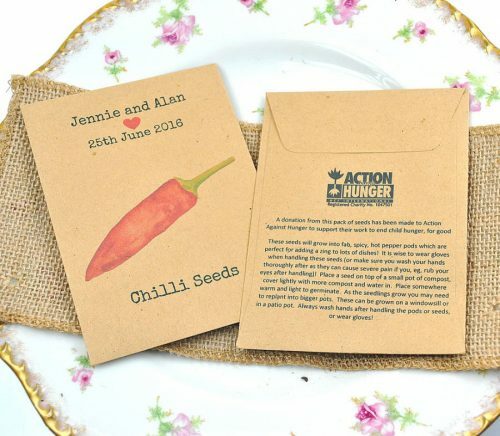 Tags: charitable wedding favours, chilli seeds, seed packet favours. 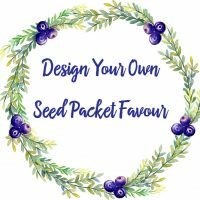 Categories: Charity Wedding Favours, Unusual & Unique Wedding Favours, Personalised Seed Packet Wedding Favours, Recycled Manilla Packets. We are delighted to have teamed up with Action Against Hunger to produce wedding favours which will help raise money for their amazing charity. 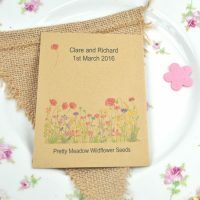 Charitable wedding favours are a unique way to share the happiness of your big day with the children and families that the charity works with around the world. By giving the gift of charitable seed packs to your wedding guests, you can support Action Against Hunger’s lifesaving work combatting malnutrition and giving millions of children the best chance to survive, thrive and fulfil their potential. These seed packets are recycled and measure 9 x 12 cm. 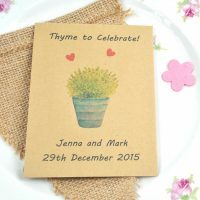 They are personalised with your wedding details – please advise these in the box above. The seeds inside are Jalapeno chilli seeds and sowing instructions are printed on the back. 20p from every pack supports Action Against Hunger UK. Registered charity number 1047501.